Welcome once again to the new year 2014. God has used the man of God Pastor E.A. 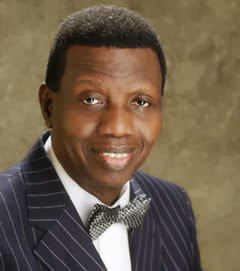 Adeboye the General Overseer of the Redeemed Christian Church of God (RCCG)to declare the new year as the year of OVERFLOW of Blessings. Please enjoy the Prophecy of the year as given at the Cross-over service, I share from a mail from Liveway Radio. Be blessed! 1. God says that a divine promise of more than a decade ago will begin to find fulfilment. 2. God Says that someone can expect a prominent divine visitation that will radically alter the cause of his or her life. 3. Daddy says that someone will have the first taste of real dominion. 4. The Lord said that there will be quite a few narrow escapes from tragedies. 1. The Lord says that the future of Nigeria will be determined this year, not in 2015 as some think. 2015 will be mere formalities. 2. The equations at the beginning of this year will be different from the equations at the end of the year, therefore don't jump into conclusions. 1. There will be more major breakthroughs in Medicine and Science. 2. God wants us to pray against noisy highly destructive storms. 3. God asked us to pray against monumental fire outbreaks. 1. Newly wed couples and elders over 70 years old. 2. Nursing mothers and pregnant women are also exempted. You can drink water during fast You can drink tea if you are overseas and it is cold. If you miss a day, you must subtitute it for 2 days. Ask God for extra ordinary grace to fast and pray and the Lord will grant you the grace to fast and pray this year. Every mountain in the path of all of us shall move this year. Any force that stand in your way shall be destroyed. The Almighty God will grant you extra ordinary grace to fast and pray.